This morning I made a quick and delicious breakfast using yesterday’s leftovers. To warm up the roasted potatoes, I tossed them in a frying pan over medium high heat for 3-5 minutes. While heating those, I chopped up the remaining mushroom slices from last night and the remaining tomato from yesterday’s breakfast. When the potatoes were done, I removed them and added the tomatoes and mushrooms to the pan. I tossed this around for a minute and added 2 eggs and a pinch of garlic salt. I broke the yolks and scrambled that around and voila…the creation below was ready for consumption. End result=use of leftovers and a healthy – AND TASTY – breakfast to get my day started. 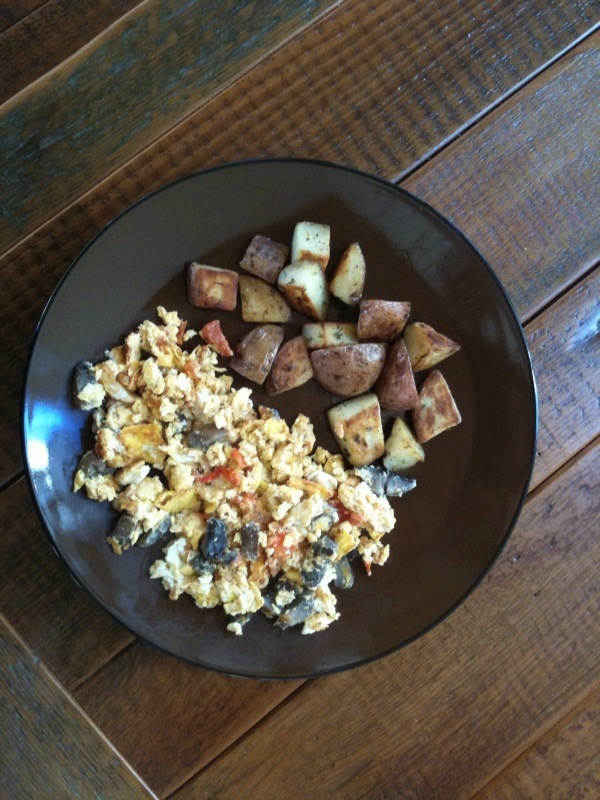 This breakfast incorporates a protein (eggs), a good carb (potatoes) and veggies (tomatoes and mushrooms). To give this a bit of heat and a smoky taste, try chopping up a chipotle pepper and adding the pepper and a tiny bit of adobo sauce with the mushrooms and tomatoes.